You can learn more about The Ultimate Escape Rooms in Solvang at theultimateescaperooms.com. The Lock Boxx mobile escape room can be found at thelockboxx.com. The Locked Inn in Grover Beach takes bookings online at thelockedinn.com. The nighttime forest hum of crickets and frogs, sometimes punctuated by a distant wolf howl, fills the wood-paneled cabin room. Lined with locked boxes, tables with drawers, a pot-bellied stove, a bed, and frontiersman accoutrements, the only modern feature to the room is a keypad-locked door. This isn't the California wilderness of the late 1800s; it's the newest escape puzzle by The Ultimate Escape Rooms in Solvang. The Gold Fever challenge welcomes visitors to figure out the keypad code with the clues in the room within 60 minutes. Host Bryan Beery ushers the small group of Sun staff into the room, and with his "best Sam Elliott voice," tells us how it was the home of an eccentric gold prospector who struck it rich. 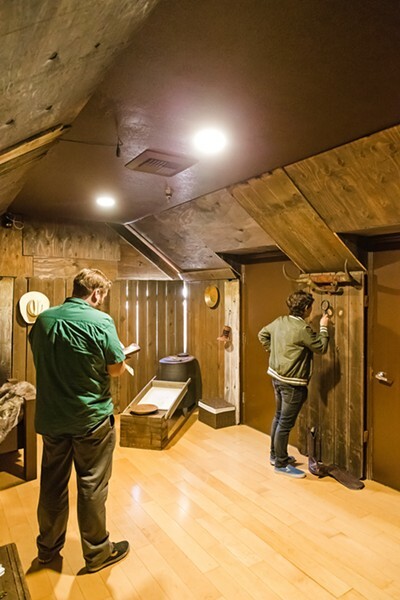 BREAK OUT The Ultimate Escape Rooms in Solvang recently opened a new experience, Gold Fever, which Sun Managing Editor Joe Payne and New Times Calendar Editor Caleb Wiseblood helped solve in 36 minutes. "Unfortunately for you, the notorious gunslinger named 'The Rattlesnake Kid' has heard this tale, and is rumored to be on the way to this cabin," Beery says before leaving and closing the door. We fan out, scouring the room for clues before the gunslinger shows up. "I found this in here," Calendar Editor Caleb Wiseblood says, pulling a magnifying glass from mounted bull horns on the wall, "in case anyone needs to magnify anything." It's not the only clue readily available, and each leads to another. "This is obviously something that opens," Account Executive Jennifer Harbaugh says, holding up a locked diary. A few minutes pass before we find the key. We pour over the pages, reading the prospector's daily accounts of his failures and successes mining for gold in the California wilderness. It takes a while before we crack the diary's secret. The puzzle becomes more and more complicated, compounded by each clue, some of which are dead-ends. But we find the code, punch the numbers into the keypad, and unlock the door in 36 minutes. The Rattlesnake Kid won't be pulling his six-guns tonight! Escape rooms have gained popularity across the United States since the early 2010s, and the industry has continued to grow ever since. A handful of escape room experiences landed on the Central Coast in recent years, challenging visitors to work together and solve a theme-based mystery in the alloted time. They're a year-round alternative to seasonal attractions like haunted houses with their flickering lights and jump scares. Escape Rooms prize fun, immersive stories and stimulating puzzles instead. 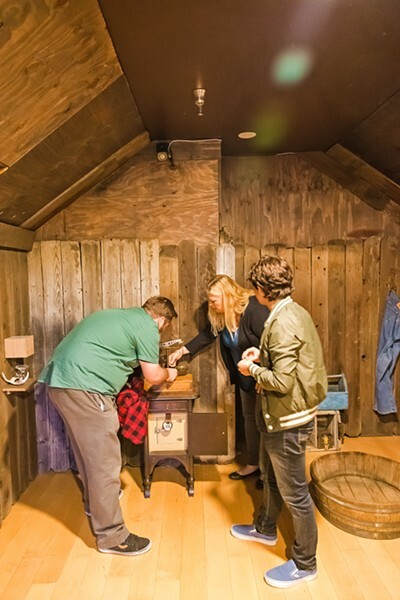 For Alexis Crouse, the co-owner of The Ultimate Escape Rooms, each room represents hours of conceptualizing and even more of labor on her and her husband's part. She pulls from her experience as a teacher and a filmmaker when creating the puzzles, and the outcome is something just about anybody can enjoy, Crouse said. "I wanted something where families and friends alike could come together, have fun, not have a cellphone, and not have any interruptions," she said. "They're interacting, working together, and learning at the same time." Will Ruoff, owner of The Lock Boxx, remembers his first escape room experience well. He was in Denver, Colorado, visiting with a friend who "was just getting into the escape room culture," and invited him along for a visit. WORKING TOGETHER Escape rooms require team-based problem solving, puzzle cracking, and creative thinking. 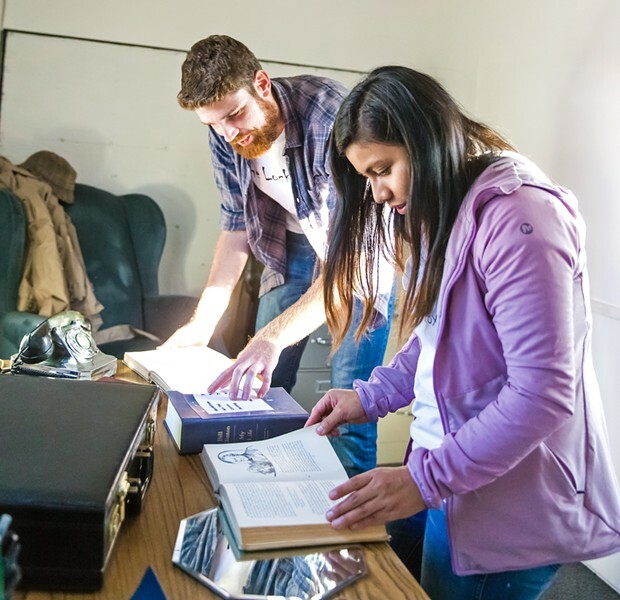 Pictured, The Lock Boxx owner Will Ruoff (left) and Lauren Marsiglia show how to approach the puzzle for his mobile escape room. Like his friend, Ruoff got bit by the bug. "That was kind of my first taste of what an escape room is like," he said. "I started to really enjoy them and started to go to a couple in LA and some in San Francisco, and then I went to the Locked Inn in SLO County." He enjoyed the collaborative aspect of escape rooms, how everyone shared in the victory of cracking the puzzle and getting free. If they're into it, everyone's hearts race, they get excited and shout out when new clues are found. The game is "high energy and high mental energy as well," he said, and part of the challenge is how everyone puts their heads together. "That's a major aspect—teamwork, and who's going to take control," he said. "A lot of it has to do with how you talk and communicate with each other, so if you're finding clues but not saying anything to anybody, you're not doing any good." Compelled to start his own escape room business in or near San Luis Obispo, but not quite ready to afford the rent for an office space, Ruoff acquired a trailer. That's when the Central Coast's first entirely mobile escape room, The Lock Boxx, was born. Ruoff takes the trailer to weddings, company events, and farmers markets. He was at Downtown Fridays in Santa Maria on Oct. 1 with a staffer who helped him translate English to Spanish. The Lock Boxx is smaller than most escape rooms, the time limit to get out is less than half an hour, and two to four people are allowed in at a time. The door isn't really locked (most escape rooms have an extra unlocked door), and the windows keep people from feeling claustrophobic, he said. ESCAPE ARTISTS Escape rooms are designed to immerse players in a specific theme. 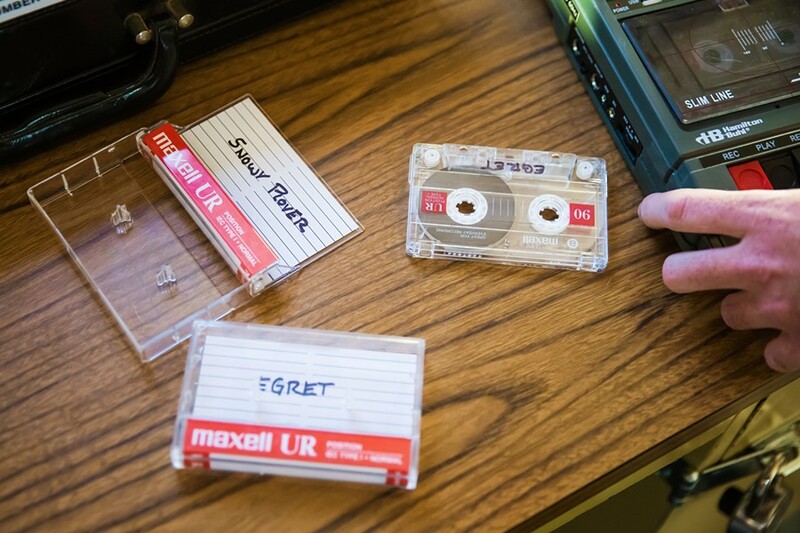 The Lock Boxx, a SLO-based mobile escape room, is set in a kidnapped FBI agent's office, which is packed with clues such what's on these cassette tapes. Ruoff said he wanted his mobile version to be accessible beyond its mobility, but to also be a less-intimidating escape room for first-timers. "A lot of escape rooms right now bring in only people with escape room backgrounds, like they've done it before," he said. "But the general population has no idea what they are. When I'm at farmers market, at Downtown Fridays, 90 percent of the people that come up to me have no idea what an escape room is." Escape room skeptics often change their tune after a first time experience in The Lock Boxx, Ruoff said, and move on to visiting local brick-and-mortar escape rooms. Having a smaller-scale escape room that he can take on the road allows Ruoff some flexibility. Businesses sometimes contact him to bring the trailer by for team-building exercises, which he often tailors to the team at the request of the company. Even small groups of military or government staff find that it's a fun, low-stakes way to improve how small teams work together, he said. "It's a really interesting dynamic," Ruoff said. "You wouldn't think that this 20-minute session would create so much dynamic interaction between people, but it really does." One of the first escape rooms to open up on the Central Coast was The Locked Inn, in Grover Beach. The location includes two separate escape rooms, each a different room at the mysterious "inn." Jessica and David Sawyers purchased the business from previous owners about a year ago, and have made efforts to expand and make some changes, but they've stayed true to the original businesses' hotel theme. The key to any escape room is the theme, Jessica said. It helps immerse visitors in the story and inform the plot and puzzle that escape room creators craft for each experience. "Ours is based on a hotel, a little bed and breakfast as we like to say, so when you walk in it kind of feels like you're checking in to your room," she said. "It's almost like you're not in Grover Beach at that point, you don't even realize, and when you come out it's like a whole other experience." The Locked Inn was the only escape room on the Central Coast for a while, Jessica said, so when she and her husband took over, they wanted to vary the experiences there for repeat customers. They've had a Halloween-themed room in the past, but this year their new room has an adventure theme. Escape room fandom is a kind of subculture, Jessica explained, from the local enthusiasts to traveling "escape room tourists" to online communities. "We try to keep ourselves up with the flow of everybody and what they're into," she said. "Like right now, everybody is into the adventure rooms, which is what we're trying to do in our new room, which is kind of Indiana Jones meets National Treasure." David does most of the creative design and building for their escape rooms, Jessica explained, and he pulls from his experience as a software developer and lifelong video gamer to come up with ideas. It's very important that their rooms are one-of-a-kind, Jessica explained, to the point that they don't often visit other escape rooms to avoid ideas rubbing off. It allows them to remain focused on their business, too, she said. "A lot of escape rooms, if you do the rooms they offer, that's all they do," she said. "They don't bring in new ones, they don't switch them out because they're super expensive. We constantly are trying to give everybody a new experience." The process can get complex quickly, Jessica explained, and includes more than just the story and puzzle writing, but set design and often electrical work. The handcrafted feel and attention to detail is what helps make their escape rooms special, Jessica said. She's seen kids walk into their rooms like they were "dragged there," she said, but leave excited to try another escape room. "I try to explain it to people, 'If you've ever grown up watching the film Clue, it's like that mixed with the adventure of Harry Potter,'" she said. "There are things that you don't expect to happen that happen. Who doesn't like a hidden door?" Solvang isn't The Ultimate Escape Rooms' only location, explained co-owner Crouse—she and her husband opened their first business in Ventura two years ago. They saw Solvang as a great location for expansion because of its reputation as a tourist destination, and Santa Barbara County's low number of escape rooms. 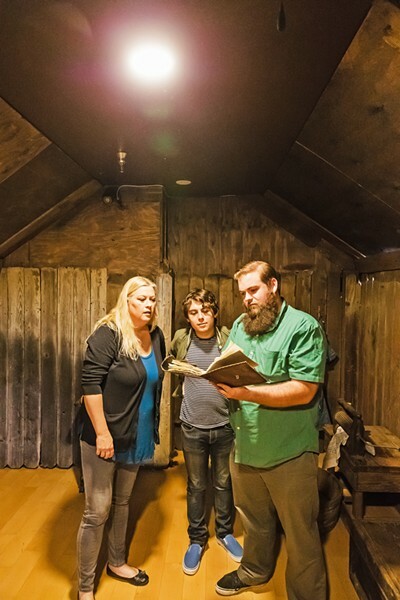 SHUT INS (pictured left to right) Sun Account Executive Jennifer Herbaugh, New Times Calendar Editor Caleb Wiseblood, and Sun Managing Editor Joe Payne helped test Gold Fever, the newest attraction at The Ultimate Escape Rooms in Solvang. The Ultimate Escape Rooms in Solvang started earlier this year with just one escape room, a Danish/Christmas-themed experience called The Mischievous Nisse. A Nisse is a trickster spirit of Scandinavian folklore. Gold Fever is the second. Knowing how voracious escape room fans are, Crouse, her husband, and their team wanted everything perfect before opening the new room. "I will not open a room until I know that a room we opened before it is solid," she said. "Though I want to get started on [the next room], I will not until this room is tried and true and ready to go and people have tried it and there's no more tweaks to make." The number of people interested in escape room experiences has swelled, Crouse said. The expansion of her business also reflects the overall growth of escape rooms as an industry. According to Room Escape Artist, a website that has tracked the number of escape room businesses in the United States since 2014, the new industry has enjoyed steady growth since the trend first caught on. For example, the number of individual escape room facilities in the second quarter of 2017 was 1,850, according to the website's annual growth report, and by the same time this year, there were 2,300 attractions nationwide. For comparison, the second quarter of 2016 only saw 900 escape rooms in the U.S.
For business owners like Jessica Sawyers with The Locked Inn in Grover Beach, the trend makes perfect sense. Most escape rooms are family friendly, she said, and those kinds of attractions aren't as present year round, especially in areas like the Central Coast. "I think what's happening, especially in towns like ours—I grew up in Orcutt and my husband grew up in San Luis [Obispo]—there's nothing to do," she said. "They've taken everything away for kids to do." That's why they've connected with local groups or nonprofits to turn their business into a venue for special events or attractions. They recently partnered with the San Luis Obispo Veterans Outreach Program and blocked out an entire day for veterans to enjoy the rooms and connect with resources like housing or medical care. LOCKS AND DRAWERS Escape rooms like The Ultimate Escape Rooms' Gold Fever are multi-faceted puzzle games complete with secret messages, combination locks, and compartments triggered by specific actions. The Locked Inn is also hoping to connect with other escape rooms, Jessica said, and they have plans for a partnership with Ruoff's The Lock Boxx. He can bring his mobile escape room to theirs, Crouse said, for an "escape room day" or other events. All of it can help stoke the popularity of escape rooms locally, getting friends and families in for their fateful first escape attempt. "I think that people go in there and have an experience that you can't get anywhere else," Crouse said. "We see that it's a trend for everything—it's such a fun thing to do but it's also such a bonding experience, a great team-building experience, and everybody likes to get out and do something. Managing Editor Joe Payne from New Times sister paper, the Sun, can be reached at jpayne@santamariasun.com.